There were a lot of specialty photo spots at this year’s Mickey’s Not So Scary Halloween Party. They start almost as soon as you enter the gates. You will be shuffled to the overflow backstage area of Main Street USA for the party entrance. Some of the more popular photo spots are here with Not So Scary props. Generally, these lines get really long. Some of the more popular photo spots are in front of the Haunted Mansion. These can get pretty substantial lines so we say do them early. Check out these pictures of us with the Hat Box Ghost. LOVE IT!! 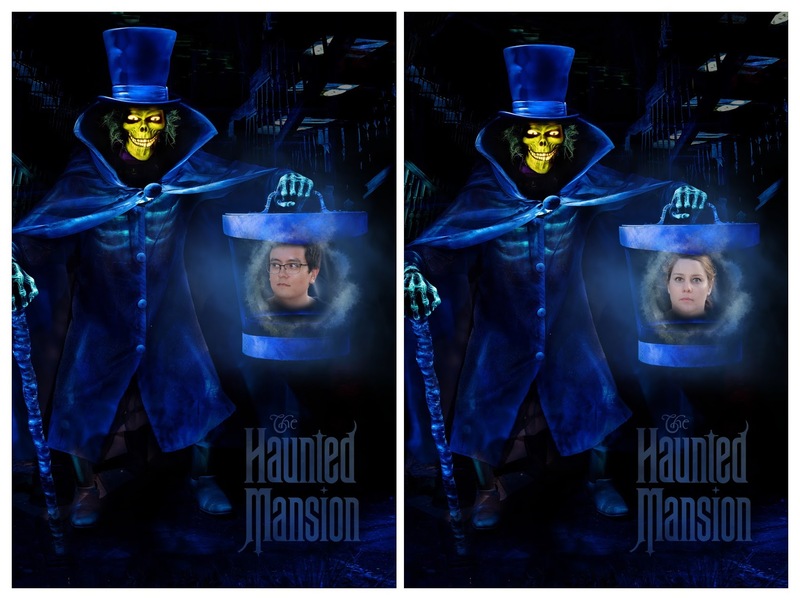 Especially since it’s a great way to bring the Hat Box Ghost to Walt Disney World. If only they would bring the autoanimatronic, please Disney if you are reading this…. Give us our own Hat Box Ghost. Character meet and greats are a HUGE deal at the parties. Meeting rare characters can mean long lines. By long I mean that it might be the entire length of the party. In particular I’m talking Jack and Sally. Other fan favorites include the Seven Dwarves, and lets not forget Mickey and Minnie in their Halloween costumes. In years past you were able to meet Mickey and Minnie together but this is, sadly, no longer the case. This means that you will have to stand in two separate lines to meet the famous couple. 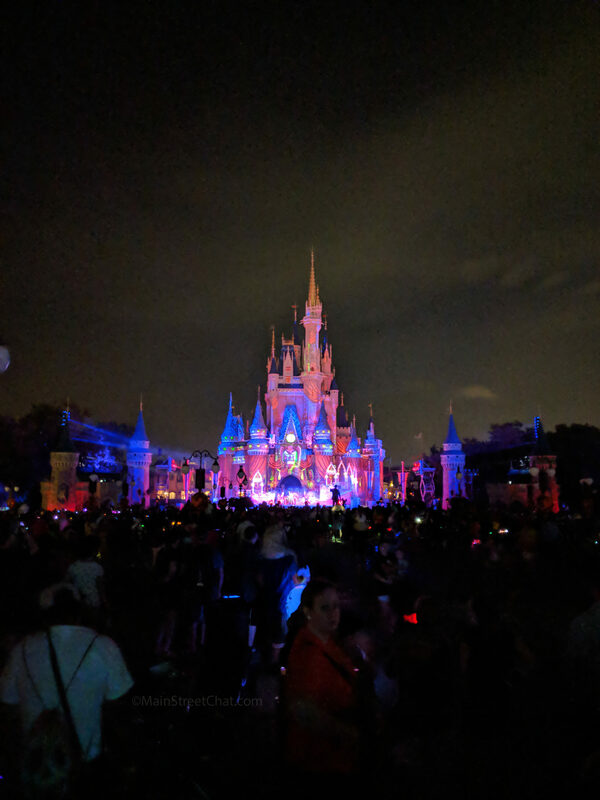 If there are characters that you really want to meet make sure to get into Magic Kingdom before Mickey’s Not So Scary Halloween Party officially starts and get in line. (The line for Jack and Sally began around four (i’ve heard of it starting as early as three) in the afternoon, and the party doesn’t start until 6.) The only character we really wanted to see was Moana for Kaitlyn and the line was already over an hour at six. Needless to say, we didn’t get to do it because she’s a toddler and that’s a really long wait. Please don’t think that someone in your family can be a place holder in the lines. It’s really frowned upon by Disney and the Cast member working with the character may flat out say no. Everyone who is going to take a picture needs to wait in line. The Cadaver Dans are really making it big this year. The turn of the century look of colorful pinstripes and straw hats are swapped out for some wild west themed cowboy outfits and some perfectly cadaver makeup. The Cadaver Dans can be found in Frontierland, usually, in front of Country Bear Jamboree. Every show we walked by was packed. The song options were great and I really enjoyed hearing them belt out a perfectly creepy version of Grim Grinning Ghosts. Okay so Elyse is a huge Hocus Pocus fan and loves this show! If you want to watch this show in all it’s glory you need to get to the Castle early! This has something of a cult following. People camp out to get a front and center spot. We really don’t know when this started happening but now it’s packed at least an hour before the show starts. When we watched this for the first time three years ago we were able to go sit on the lawn and relax and watch it from a distance. Now it’s so popular you can’t really do that and get a good view. This is the real reason we brought Kaitlyn to the Halloween Party. Sadly, she didn’t even make it! The parade doesn’t start until 9:30 and she was so over tired by that point that she had to go back to the hotel with her Dad. Know your kids parents! we were hoping that she would still be on Arizona time for Mickey’s Not So Scary Halloween Party but it just didn’t work out. This parade is a great for young children with many classic characters making an appearance. 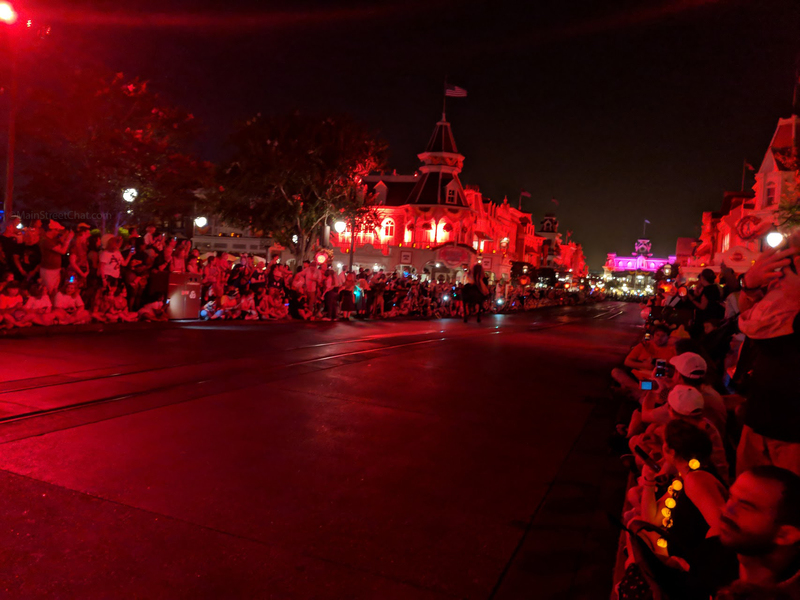 Here’s the deal with the first Parade, you need to get to Main Street an hour early to get a good spot. Depending on how large your party is you might even want to get to Main Street up to two hours early. (I’m not kidding here folks, when we staked our spot an hour early we had to look for a few minutes to find a place to sit.) After finding said spot, guard it! Seriously. I need to tell you all a little story about my experience with this and it doesn’t contain the Disney Magic we are all so used too. After we had our spot for about fifteen minutes another family came up and sat next to us. No problem, there was plenty of room. This was at approximately 40 minutes before the parade. This family had a young man with them who was a bit on the shy side. Right before the parade started (5 minute range) , a grandmother came up and asked a friend who was traveling with me if we minded her two granddaughters sitting directly in front of us. They were young, about four and seven. Were these bad manners on the Grandmother’s side? Absolutely, the rest of us had been camping out in our spots for an hour. I, however, am not going to take that out on the kids! They can’t help who they are related too, after all. I will always say yes to a child who wants a better view of the parade, or any show at Disney. In fact, I’m known for grabbing kids around me that are shorter than I am and shoving them in front of me so they can have a good line of sight. The aunt of the shy boy lost it and started yelling at the Grandmother, cuss words and all. This was appalling. I understand telling the Grandmother that she couldn’t stay. The two girls however were innocent in this. I did mention that I didn’t mind if they were in front of me but this lady was having none of it because her nephew had waited and no one was going to obstruct his view. Unfortunately, the younger of the two girls was frightened and wanted to leave. I get that what the Grandmother did is technically very rude to those of us who have waited. I agree that they should have waited if they had wanted a good spot. But please be kind to the children. For many young kids the parade is the highlight of the night. Okay, that’s just my little rant on the situation. Should Kaitlyn’s view be blocked hopefully a taller adult would be kind enough to let her stand in front. I’ve got to be 100% real here everyone. Hallow- wishes looks dated. Ever since Happily Ever After came out none of the firework shows can compare. The fireworks look small and muted compared to what you see nightly at the Magic Kingdom. I’ve got to say that it’s time for a serious reboot! This is great for little kids who enjoy trick or treating. We focused on rides and shows this year at Mickey’s Not So Scary Halloween Party. We aren’t too big on spending our time trick or treating since the rides have lower wait times than normal. Try starting with the trails in the back of the park. Frontierland wasn’t crowded at all when the trails opened and lines were moving quickly. On the plus side if you do enough of the trails you definitely will not need to go candy shopping for Halloween. Do We Recommend Mickey’s Not So Scary Halloween Party? This is a complex question for us. If you’ve never attended before than we hands down recommend it. Seeing the park decked out in all it’s not so scary glory is awesome. If you’ve gone in the past and loved it and it’s been three of four years since your last party, again, we would say to go ahead and attend. However, and this is a big however, if you have a large family with small children and the tickets are going to be a stretch for you. HOLD OFF ON ATTENDING. Mickey’s Not So Scary is getting to the point where it is going to need a serious update. Not only do the fireworks look dated but the parade is starting too as well. The last serious update was around 2005. Please don’t misunderstand, we love the parade but as will all things Disney, things evolve and get better. With new float technology its time for an update. 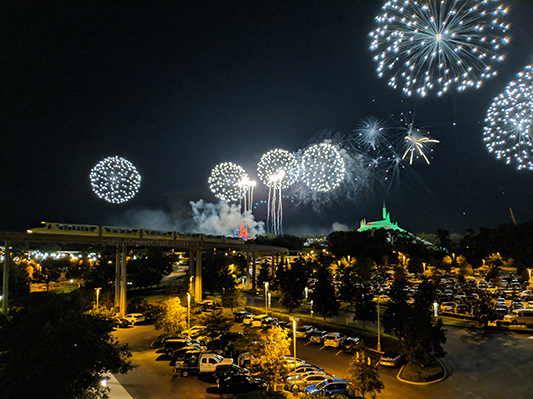 We recommend doing a desert party for Happily Ever After so you get an amazing view of the show without spending tons of time waiting on Main Street. Especially since during winter the fireworks go off at 8 30 so you don’t have to try to force your young children to stay awake. We are all about avoiding the over tired meltdown. Check out our review of Mickey’s Not So Scary Halloween Parties new attractions and specialty treats that we tried here.